I was brought to this place by a native Indian girl. She told me it was the best Indian restaurant she had found in Barcelona and that it reminded her of home. She was right, as the dishes were delicious and actually I ended up bringing some of my friends for round two. The décor is quite simple: at first it’s not very inviting, but once you try the dishes, that will be the last thing you’ll care about. Looking around one of the peculiar things about this establishment is how its walls are full of pictures of its staff with various famous characters. 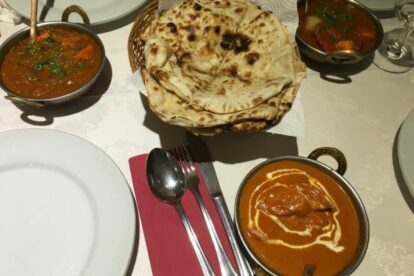 You will find chicken or lamb dishes, seafood dishes such as salmon or prawn curry, dishes with bread, one of my favourite being Cheese nan (traditional Indian bread cooked in an oven), and vegetable-based dishes for those who are vegetarian. You can also find the popular traditional yogurt-based drink called Lassi. Moti Mahal offers a variety of Lassi from mango lassi to banana and chocolate flavour. If you are in the multicultural neighbourhood of el Raval and hungry for Indian food, this is the place!